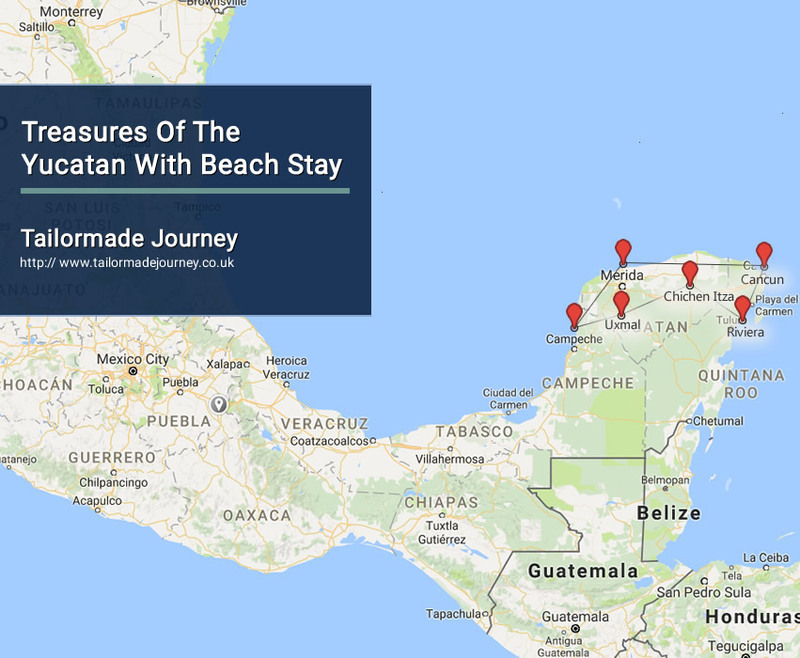 This 10 day adventure will take you from the white sands and crystalline water of the Riviera Maya through the jungles of the Yucatan Peninsula and into the incredible and mysterious world of the ancient Maya. Overnight Stay at the Hotel in Cancun . After breakfast, we’ll head inland for an expertly guided tour of the beautiful Mayan archeological site of EkBalam. Next, we head to Valladolid, the first capital city of the Yucatan, for lunch and a stroll around the center square. After a city tour, we’ll continue on to Merida, “The White City,” where you’ll have free time to explore the city. Overnight stay at the Hotel in Merida . After breakfast, we’ll head out with our city guide to explore the historic city of Merida. First, we’ll travel the Paseo de Montejo, lined with Colonial mansions and modeled after the Champs Elysees in Paris. We’ll stop at the Central Plaza to view the beautiful Cathedral, the ornate Casa Montejo, and the renowned murals of the Palacio Nacional. We will also view the incredible collection of Mayan artifacts at the Anthropology Museum. After lunch at a local restaurant, you’ll have more time to explore the city on your own. After breakfast, today we travel to the Biosphere Reserve of Celestun, one of the regions most protected areas as well as a UNESCO site. Here, our guides will help us navigate the serene waters of this massive wetland site to view one of the world’s most important Pink Flamingo colonies. Lunch is in the shade of a charming thatched-roof beach restaurant, and then we head to the UNESCO World Heritage site of Campeche. In this fortified city, we’ll visit the Bulwarks, the Puerta Tierra stone fortress, and the colorful and historic city center. This evening, you’ll enjoy a Highlight Dinner at one of the city’s most delicious restaurants. Overnight stay at the Hotel in Campeche. After breakfast, we start the day with an expertly guided tour of the Mayan archeological site of Edzna, with its breathtaking temples and ceremonial sites. Traveling along the Puuc Route, we’re awaited by a tasty traditional lunch – marinated pork and chicken wrapped in banana leafs and slowly cooked underground. After lunch, we head to the legendary Mayan temples of Uxmal, another UNESCO World Heritage Site. This classic Maya site is a highlight of the Yucatan and dates back to the 10th century AD. It is considered to be one of the most complex and impressive expressions of Puuc architecture. Our expert tour guide will illuminate the Mayan mysteries of the region as we learn about its engineering, architecture, and society. Today ends at our hacienda, where we’ll relax, cool off in the pool and after dinner, we have a Tequila tasting, where we’ll learn about Mexico’s national drink. Overnight stay at the Hotel in Uxmal. Overnight stay at the Hotel in Chichen Itza. After an early breakfast, we utilize our private entrance into Chichen Itza, one of the the New Seven Wonders of the World, to explore the site with our expert guide. The journey continues to Coba, where we’ll have lunch on the shores of a beautiful lake. After lunch, we’ll visit the towering temples of Coba, some of the tallest in Mexico. This unique site has barely been restored and while only a few structures have been uncovered, it’s estimated that some 6,500 still remain to be exposed. Today is a day of leisure. Relax, swim in the pool or the crystalline waters of the Caribbean, and take advantage of the complementary activities offered by the resort. Enjoy the all-you-can-eat breakfast, lunch, and dinner at your choice of the resort’s various restaurants as well as snacks and beverages (including beer, cocktails, and wine) whenever you’d like! Optional day trips to Tulum, a Mayan archeological site perched picturesquely on a cliff overlooking the sea, to the mangroves of Sian Ka’an, a UNESCO Natural World Heritage Biosphere, or stroll down Playa Del Carmen’s walkway, lined with shops, bars, and restaurants. Overnight Stay at the Hotel in Riviera. Transferred to Cancun Airport to board flight for Onward Journey.